BPS Recovery Partner David Sampson with Marque Lawyer’s Kiera Peacock (L) and Emma Johnsen. Eat my spray might be the boast after BPS Recovery secured the Liquidator’s Trophy at this year’s Chartered Accountants ANZ Annual Sailing Regatta hosted by the Cruising Yacht Club of Australia (CYCA) last Thursday. 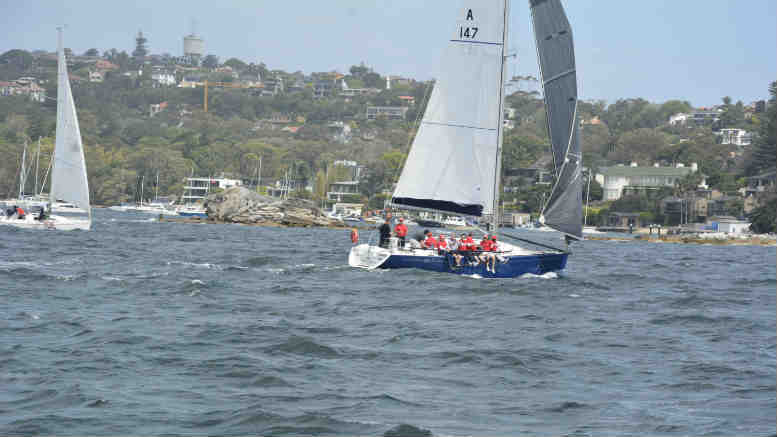 The win, by BPS partner Max Prentice’s Ticket of Leave (ToL), wrenches back the coveted title from Paul Billingham, who had relieved 2016 winner Prentice of the trophy when the CYCA commodore and Grant Thornton partner won aboard his yacht Defiant (currently for sale if Facebook’s to be believed) last year. In truth this year’s result was all but sealed from the very beginning with ToL securing a brilliant start courtesy of cunning pre-race manoeuvring by Matt Prentice. That start allowed ToL to revel in the conditions, which saw 15 to 20 knots of nor’east breeze push ToL and David Sharp’s Midnight Rambler well ahead of the remainder of what was this year a significantly diminished fleet. The two yachts then spent the race alone and mostly aligned as the afternoon edged towards a heavy afternoon downpour drenched Rushcutter’s Bay not long after the two leading boats crossed the line. Organisations represented aboard ToL and Arthur Psaltis’s Into the Mystic included, Macquarie Bank, Marque Lawyers, Polczynski Robinson and Thurlow Fisher. Presentations and further revelry followed in CYCA’s revamped clubhouse. Hopefully organisers took note of the reduced fleet this year and resolve to restore the event in 2019 to its traditional date sometime in late Summer. Disclaimer: your correspondent sailed as crew on Ticket of Leave and received a CA gift bag, BPS Recovery polo shirt and a more than generous allowance of rum by way of recompense. Be the first to comment on "BPS Recovery dominates CA regatta – again"